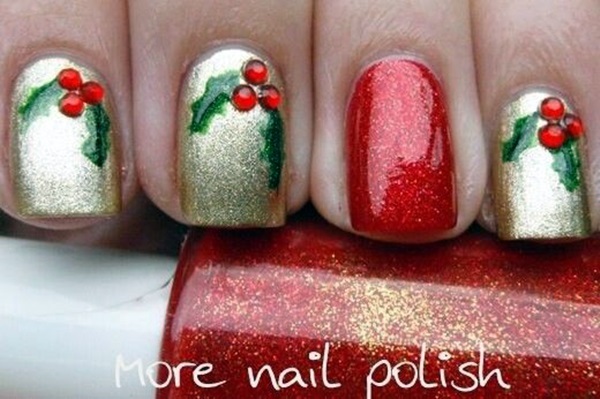 Christmas is not so far and lot of things to shop for, isn’t this true? 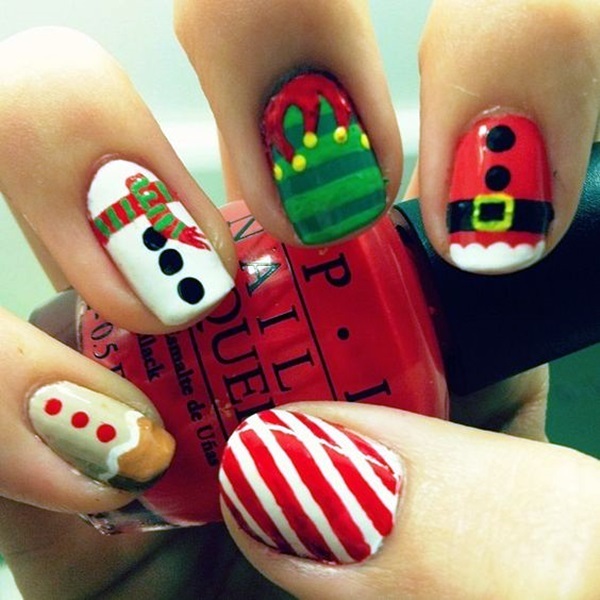 What are your impressive plans for this season’s Christmas party? 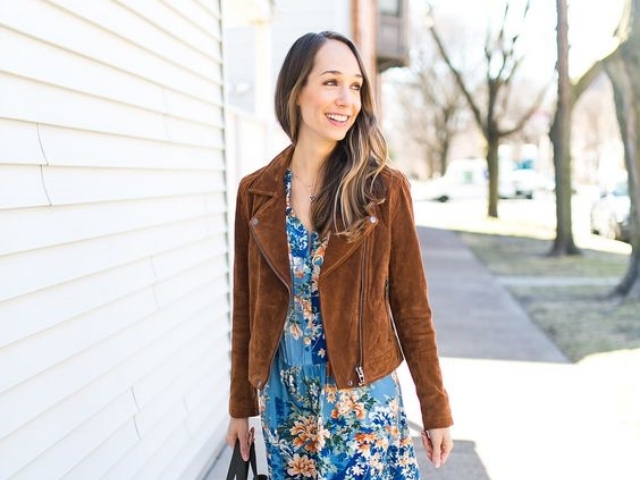 Hey Fashionables! 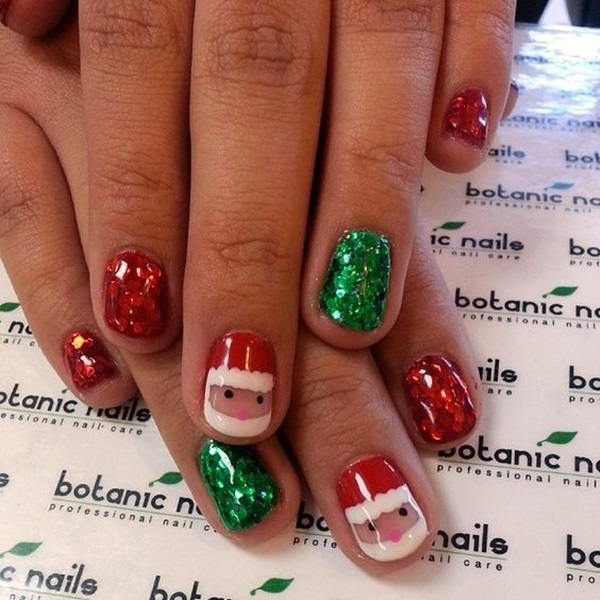 We all know that Santa is the main element for a successful Christmas celebration, isn’t it! Santa reminds us of everything that is good in our lives. 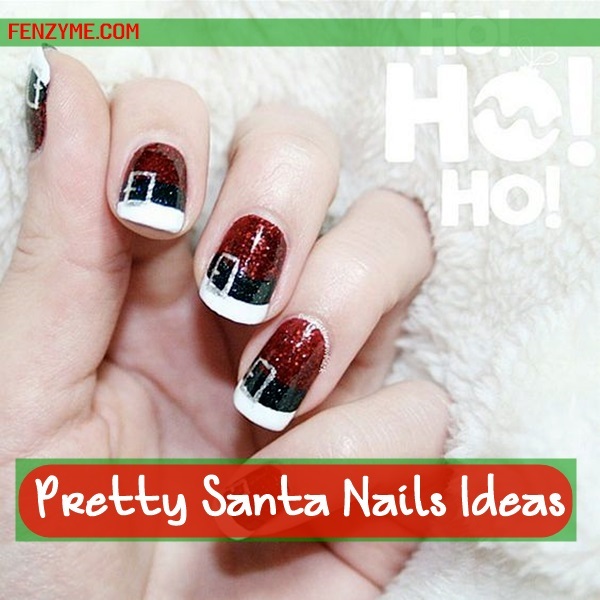 Today, our post is all about decorating our nails with pretty Santa nails ideas. Friends! 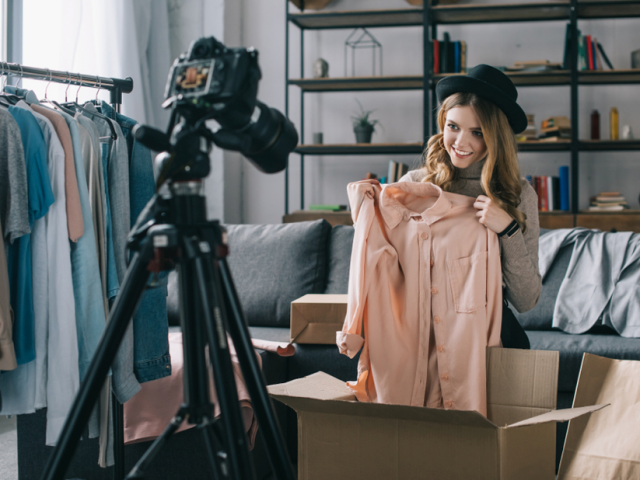 We have been constantly updating many inspiring ideas about Christmas decorations, so that you can bring in your Christmas spirit in your sweet homes. 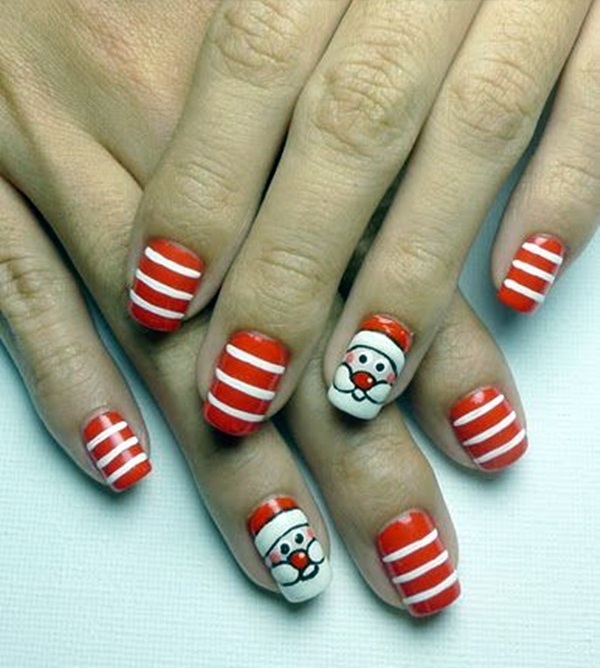 However, one of the great ways to celebrate one of the most favorite holidays of the year is to have a Christmas inspired nail design….Santa’s face, coat or hat designs are popular among them! 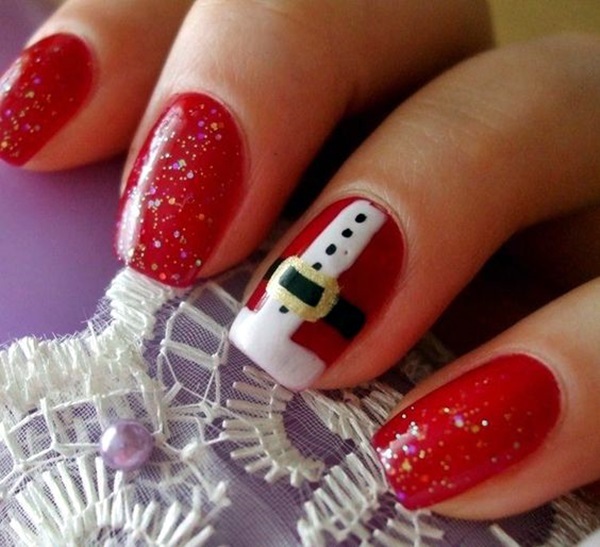 Match your nail designs with these Christmas Party Outfit Ideas! 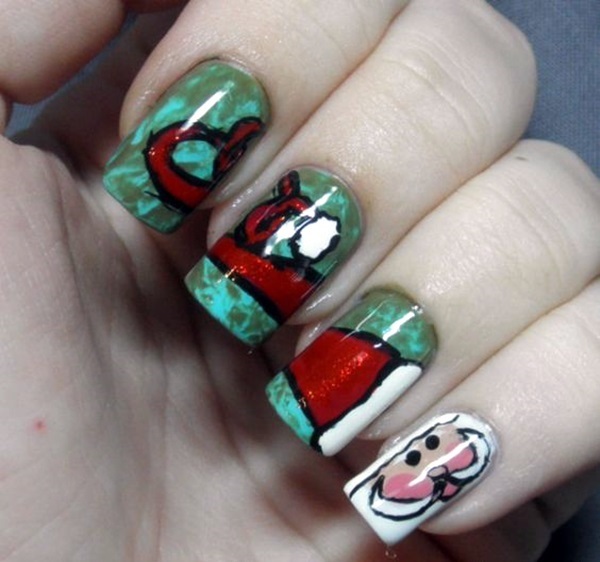 Santa may seem to be favorite actor for many of you since childhood and you love to hear stories based on Santa’s life. 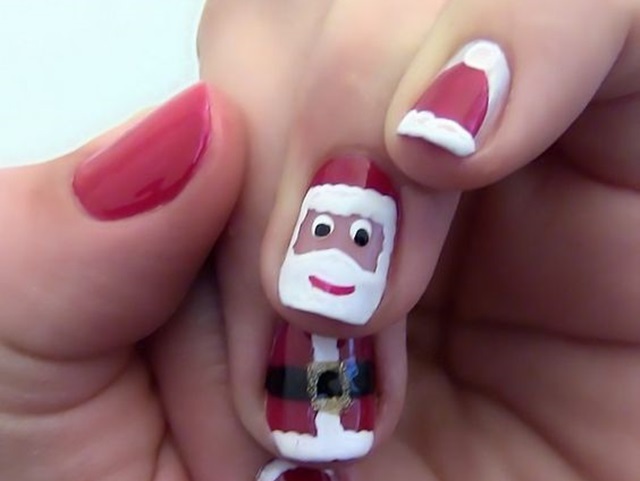 Inspired by keeping this view in mind, here we present 12 perfect Santa nail designs that will take your breath away. 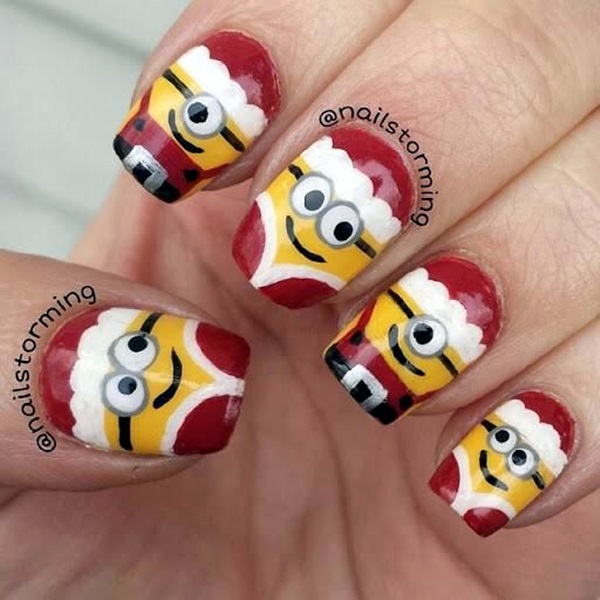 These ideas are FUNNY AND UNIQUE! 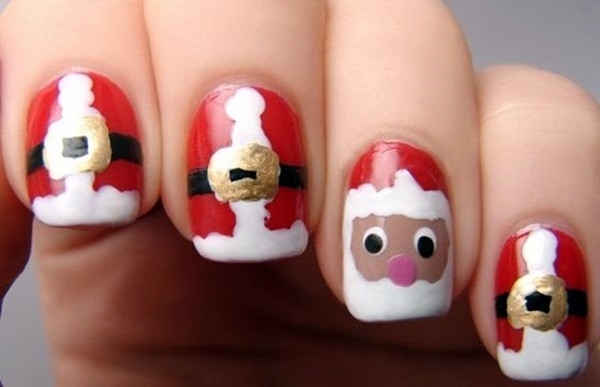 Remember, having Santa nails will make you feel magical. So, take a look and stay shinning. Cheers!! 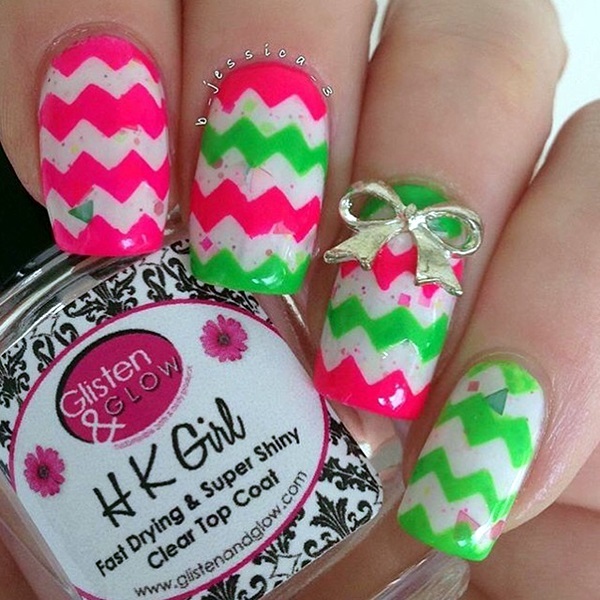 Mix and Match Zigzag Lines! 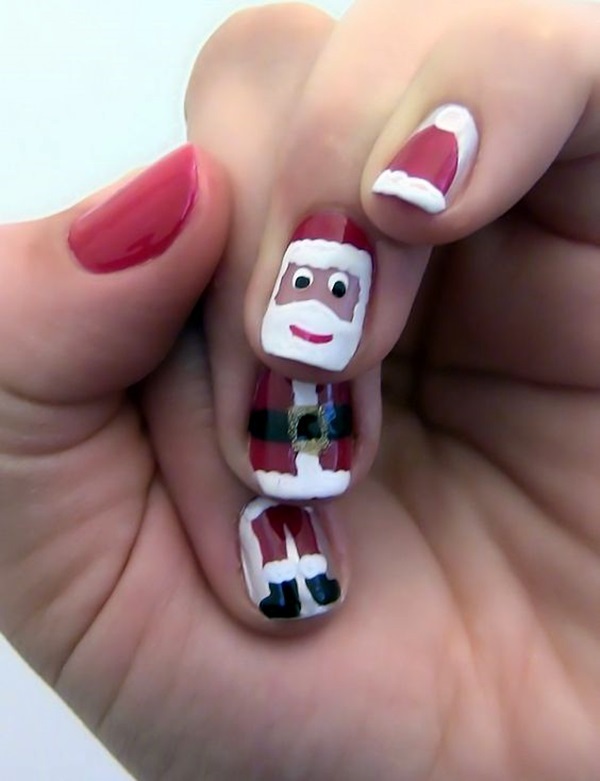 This is an incredible, creative and extremely beautiful nail art idea for Christmas party. It’s very simple and easy to do. 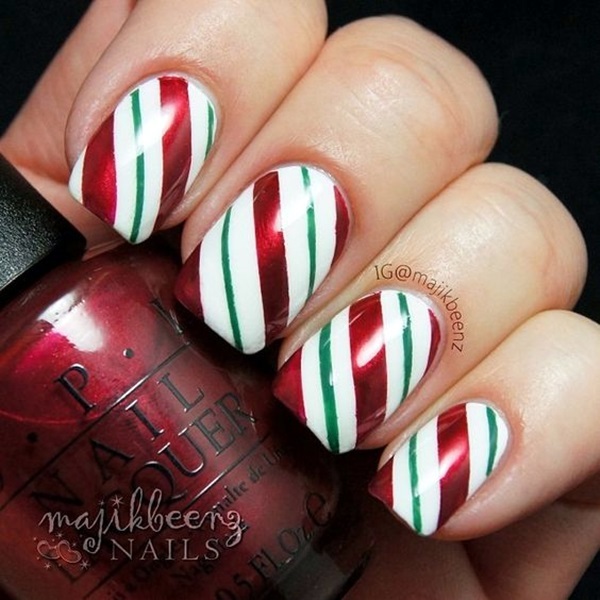 To achieve this, apply white color as base and draw zigzag lines using red and green colors on four fingers, whereas draw a cute Santa face on thumb. 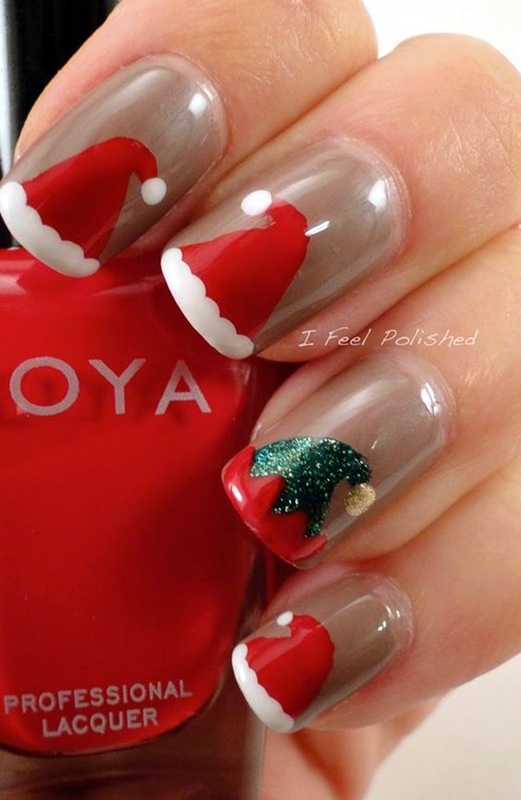 We assure you that you’ll totally fall in love with Santa’s floppy hat idea as pretty Santa nails ideas. 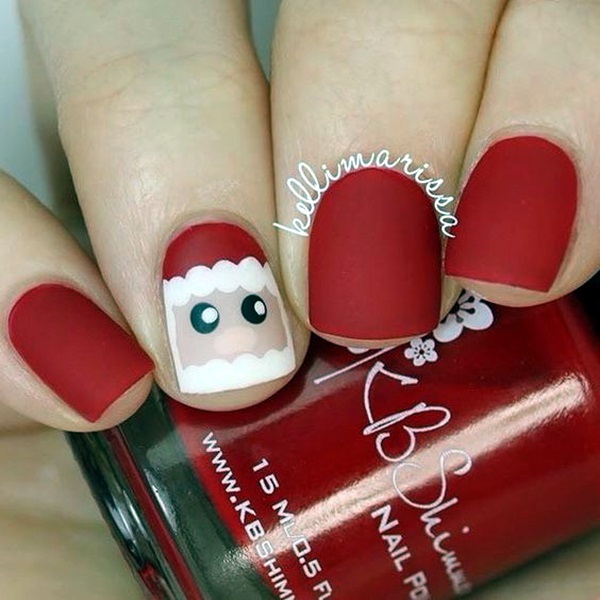 Using red and white colors create an outstanding Santa’s hat figure on your nails, with white at the tips and red at the rest of the left area. 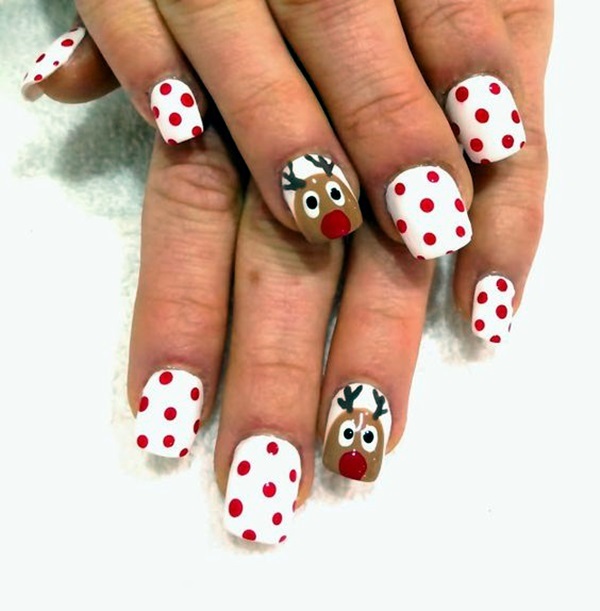 In your idle time or whenever you want to refresh yourself, try for these Holiday Nails Art Designs and make your free time worthy. 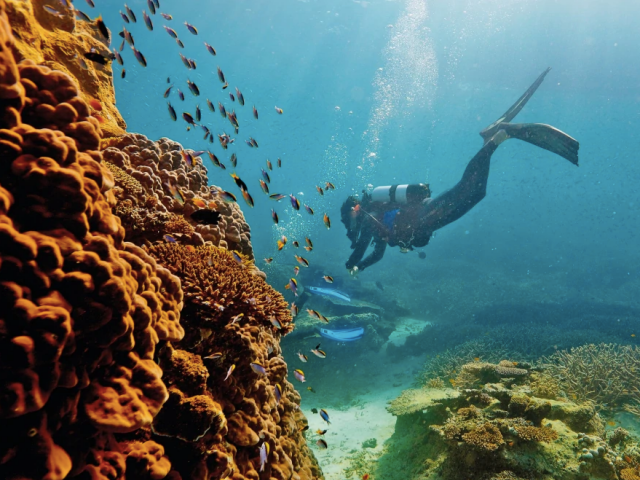 Amazing to look at! 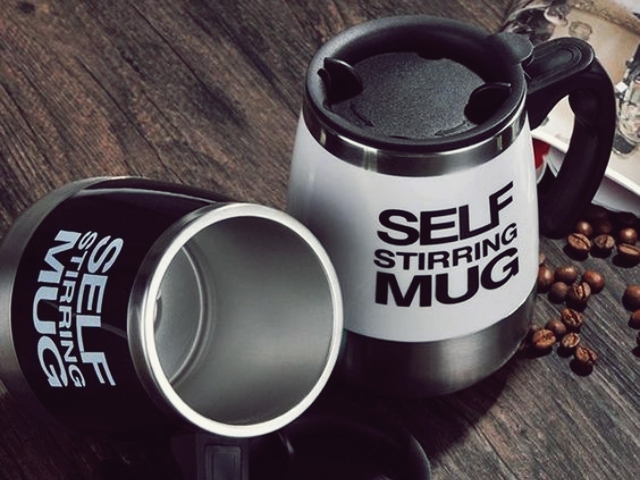 Wow….really. 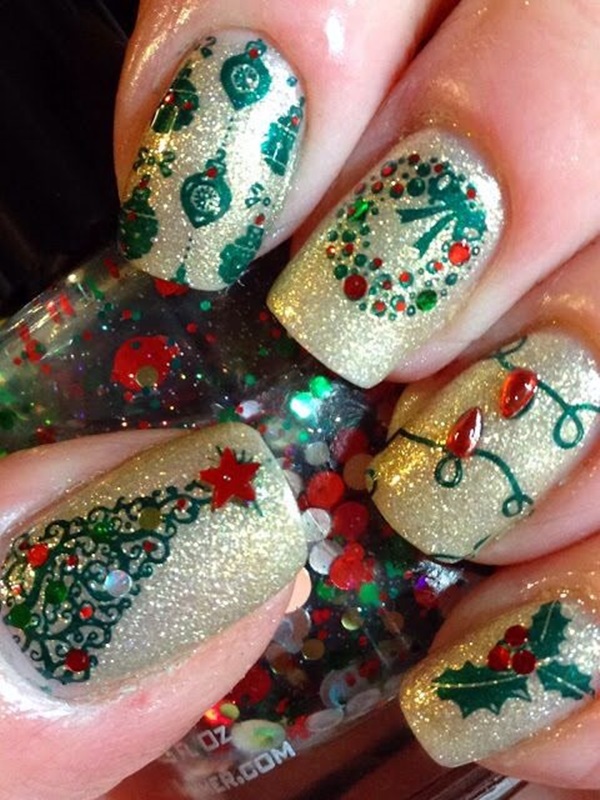 This one may take a bit more time than other designs for a finished look. 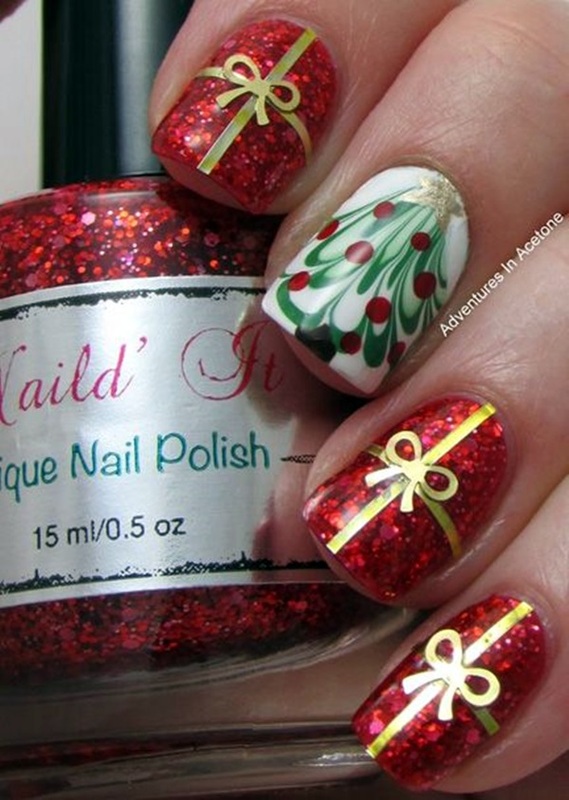 The design adds fun to your life and looks funky for a Christmas party. 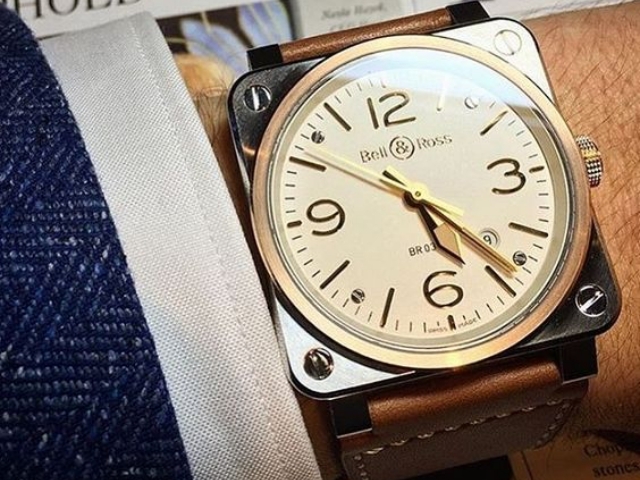 We suggest you to apply white at background, so that it stands out more. Gals! 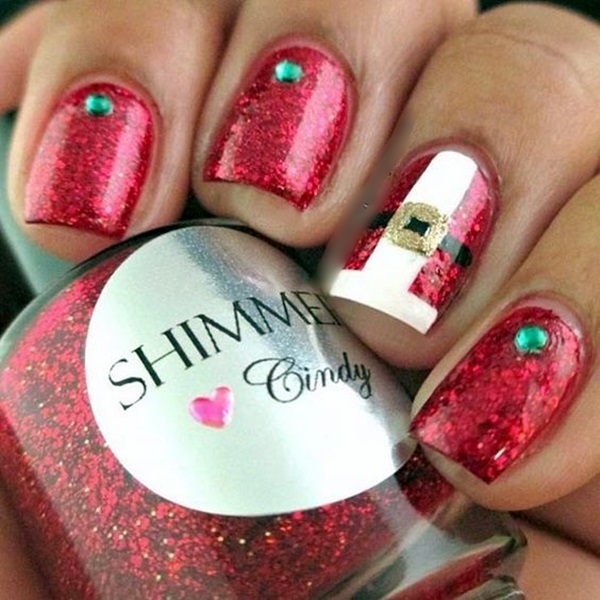 Never underestimate the power of combining matte nails with glittery ones for a catchy Santa’s hat design. 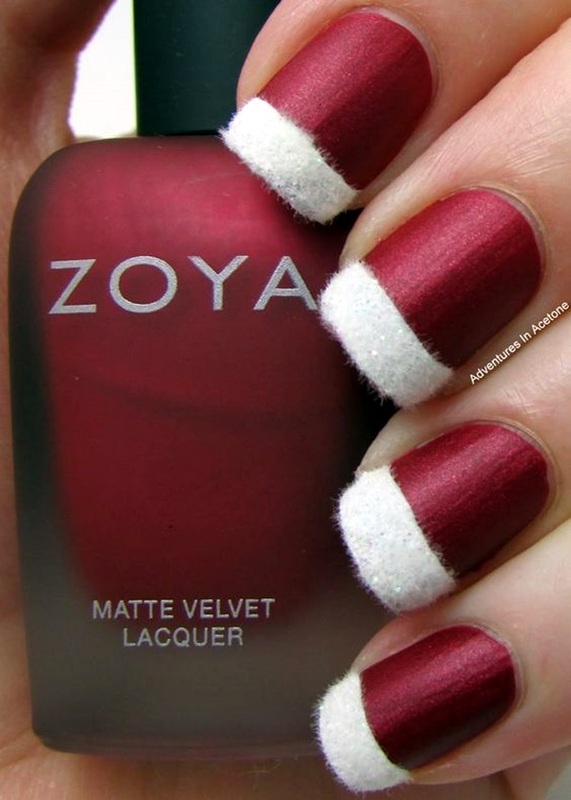 If you can’t find the two colors in one bottle, just opt for individual one and combine for a fabulous look. 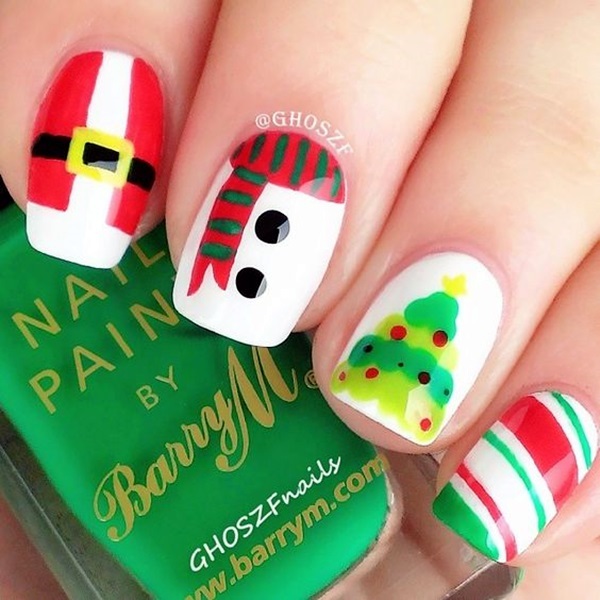 Soft Snowflake with spooky Santa’s Face! 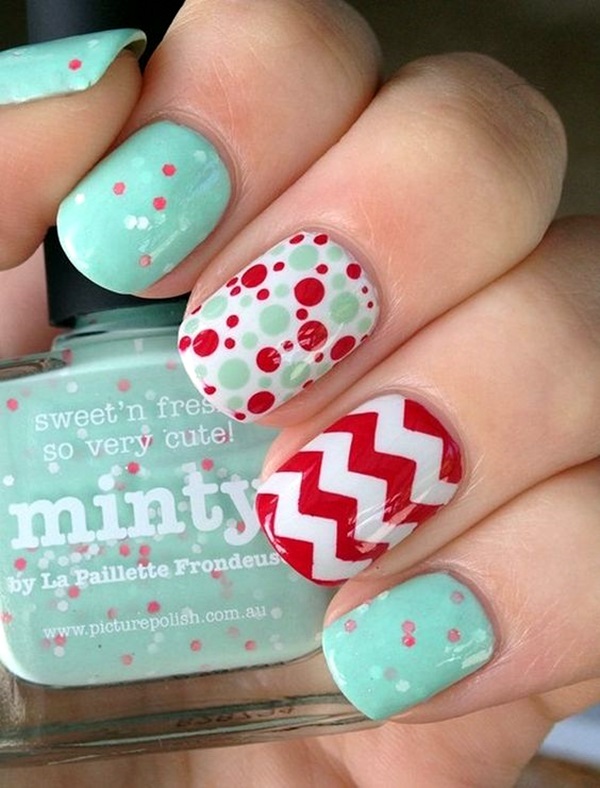 Don’t you think snowflakes are perfect for a chilly Christmas party? 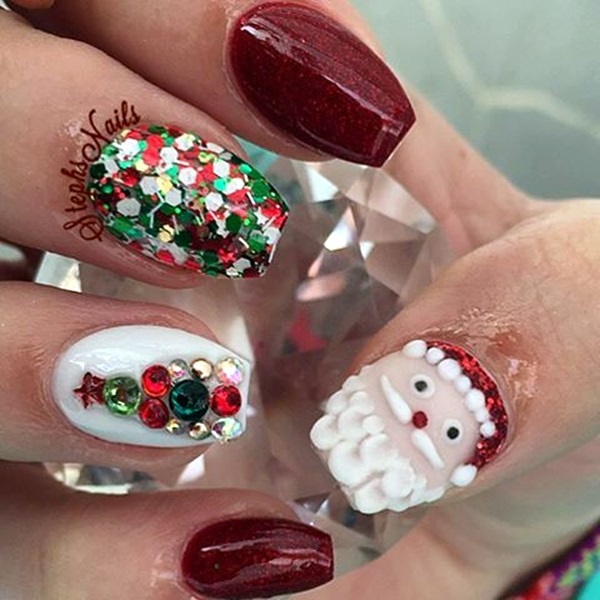 If you want to exude happiness and optimism through every nail pattern, then this soft snowflake design will fulfill all your dreams and holds important place among other pretty Santa nails ideas. 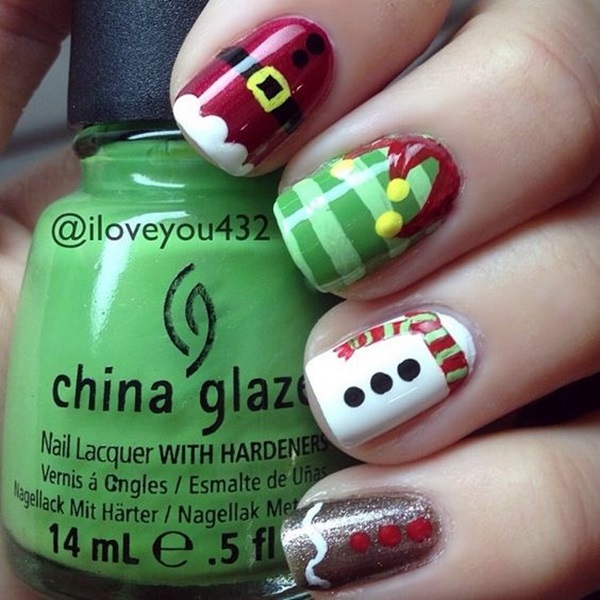 Christmas is a season to be chic and trendy, right! 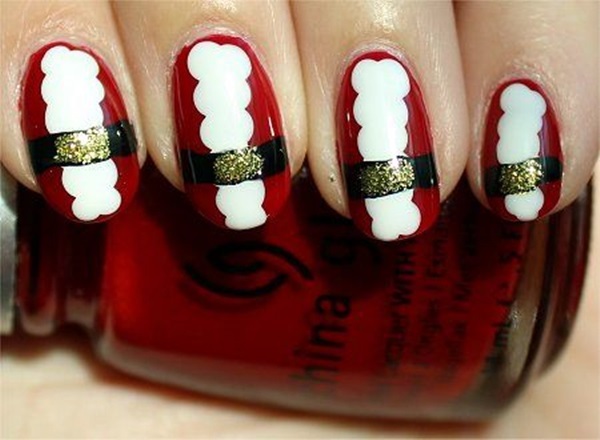 Are you tired of your old classic nail and looking some more creative and stylish? Now, Hot Diva’s! 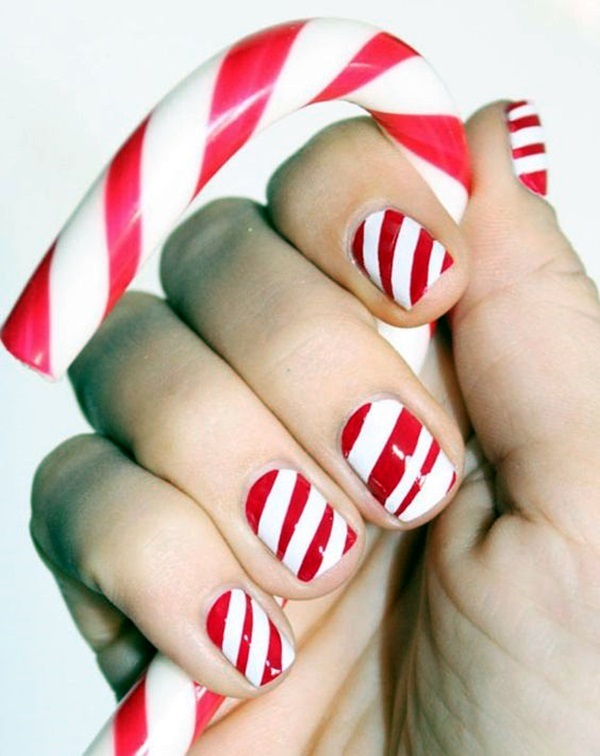 You can bring a bit of a twist to your nails by drawing Santa’s hat on tips and keeping rest of the nail simple..! 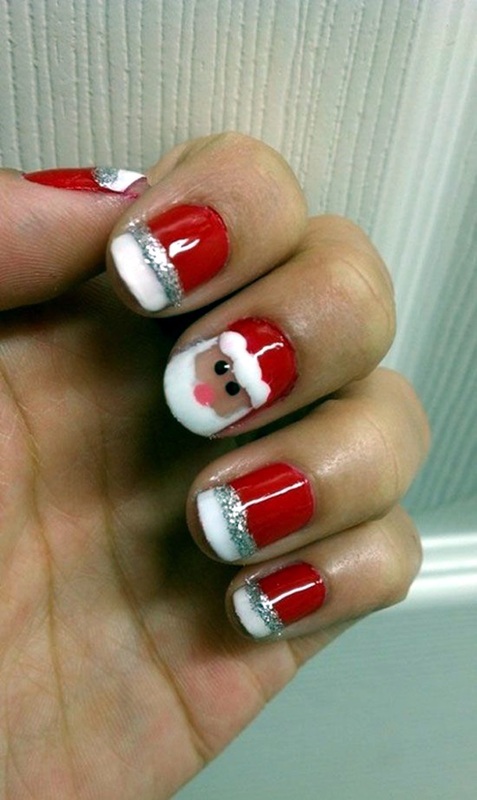 Winter Snowfall over Cute Santa Face! 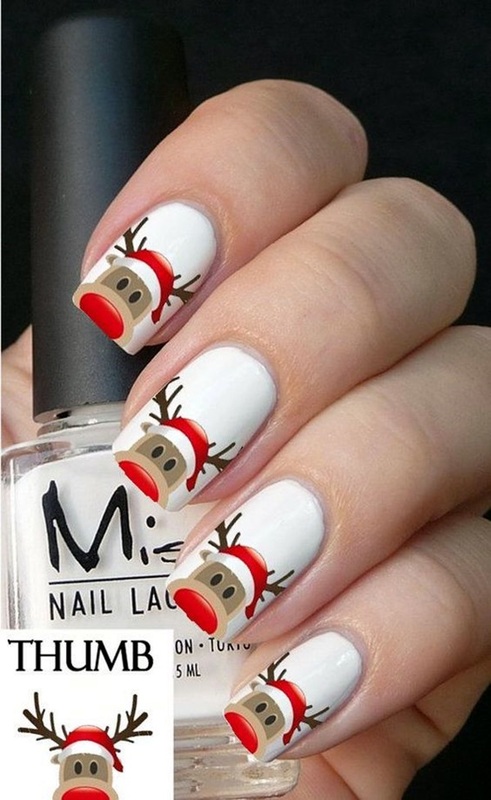 If you think that you can’t draw cute Santa face on all your finger nails, then you can try to create huge impact with winter snowflakes on all fingers and by drawing face on thumb. 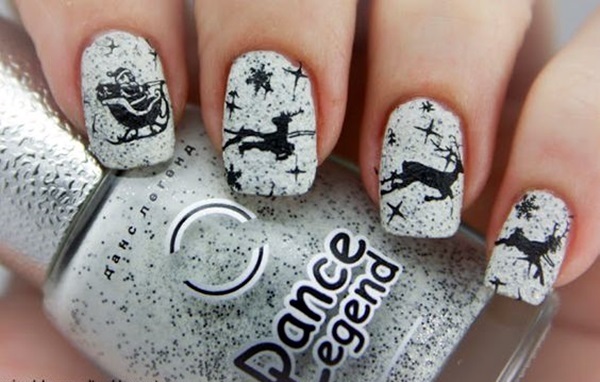 With a simple combination of navy polish and silver glitter, you can get easiest snowfall nails! 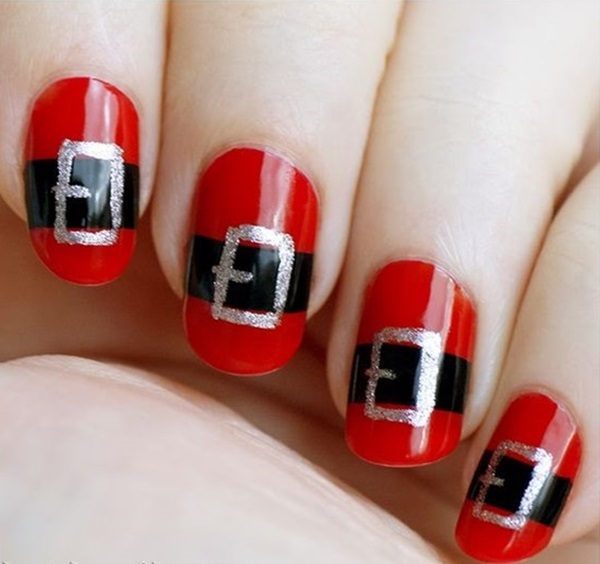 To make your Christmas nail design little bit more interesting and captivating, create Santa’s belt pattern on each alternating finger using red and black paints. 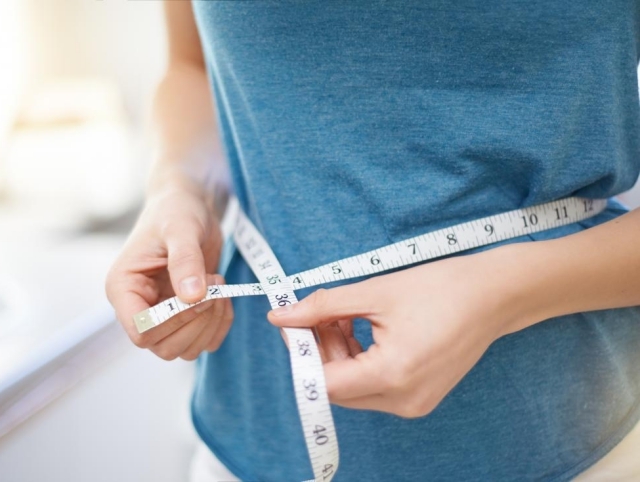 It’s simple and easy! Got it! 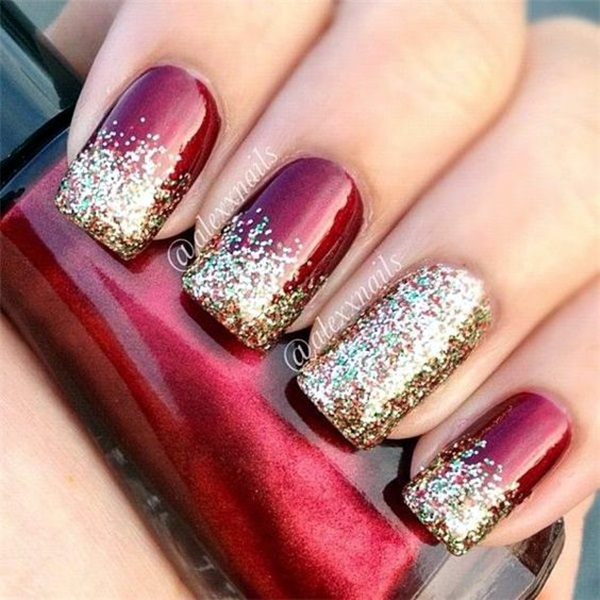 Give a look at some easy nail polish ideas and design and make your life much easier. 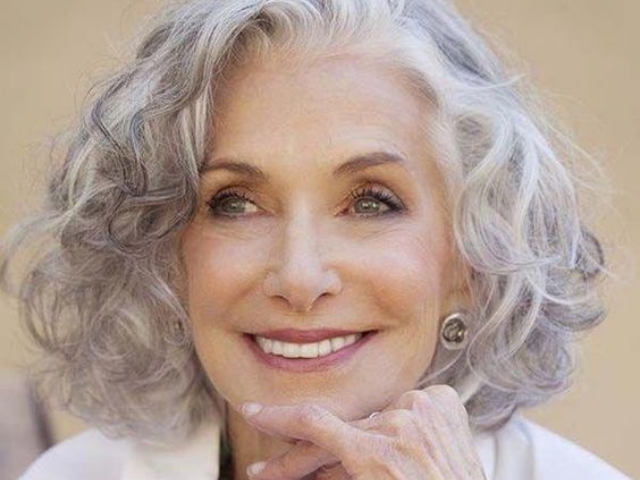 At last….Gals! 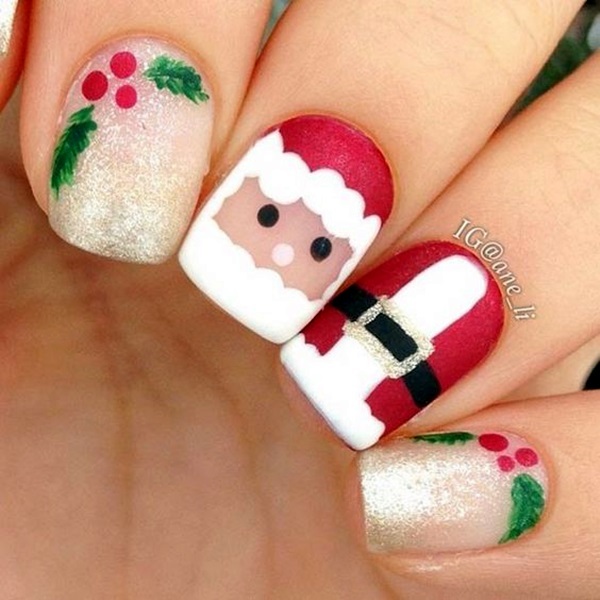 Holidays are coming and you can have the most beautiful nails ever, if you choose pretty Santa nails ideas. 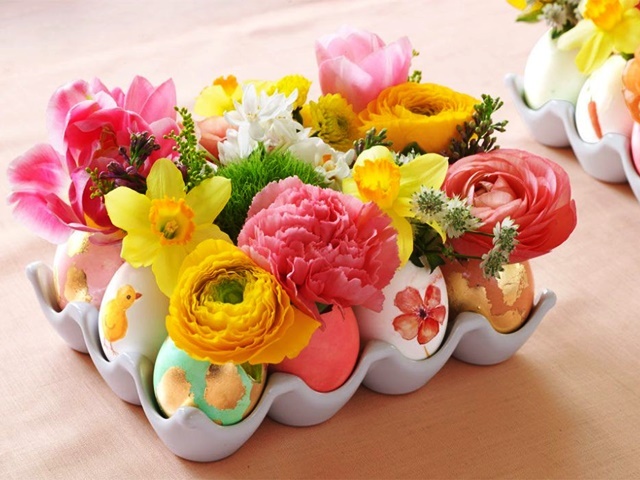 Be unique and different this time. 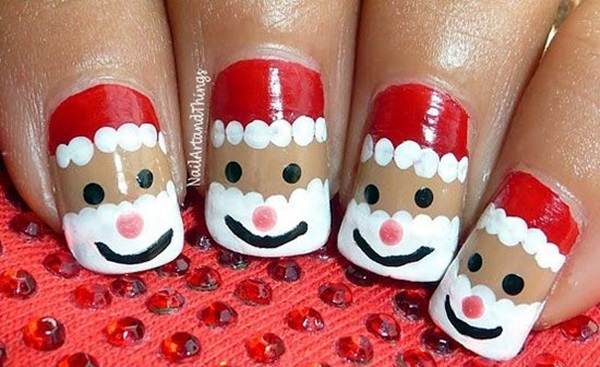 With Santa clause nail ideas, you’ll be surprised to know that what all things you can fit into your nails. 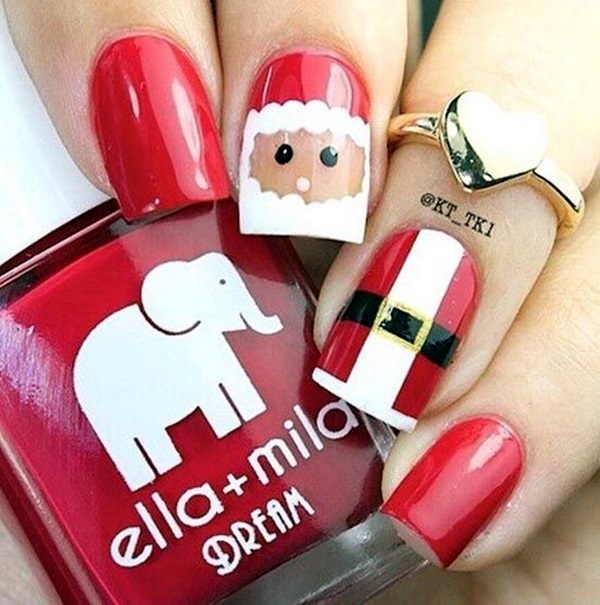 You need to …..Bring back the small child in you and think about what all things you love about Santa to highlight them on your nails.